With a little over a month to go until the UK’s Brexit deal is meant to be finalised, it still feels like we’re none the wiser to what the end agreement will be. It’s difficult to keep up with how Brexit talks are progressing and this uncertainty can be unnerving for investors. What we do know as portfolio managers is that the final outcome, whatever it is, will have a significant impact on financial assets in the UK. As politicians have been preparing the terms of the divorce over the last two years, our portfolio managers have been adjusting your portfolios to limit the downside and capture as much upside as possible in the final outcome. There are some key assumptions our portfolio managers base their analysis and decision-making on when monitoring the markets, simulating scenarios and adjusting portfolios to ensure they are built in the right way to reflect your risk appetite and the political backdrop. This is not our political view on Brexit, but how we believe the financial markets will react to the outcomes in the immediate aftermath. A soft Brexit would keep Britain aligned with the EU and Britain might stay in the single market and also the customs union. This should minimise disruption to trade, supply chains, business, and the economy. A hard Brexit would see Britain leave the single market and customs union and have to make new trade deals with its EU partners and other countries. The UK will be subject to a 10% increase in tariffs on British goods and services and a significant increase in bureaucratic checks on goods passing through ports and airports. To gauge market sentiment on Brexit negotiations, look no further than sterling. When the UK looks closer to securing a soft Brexit, the pound rallies in value, whilst a shift in tone towards a hard Brexit causes it to fall. The FTSE 100 is a list of the 100 largest companies listed on the London Stock Exchange, but given their global nature, the majority of the profits earned by companies within the blue-chip index are earned in dollar. The FTSE 100 and sterling generally have an inverse relationship, as all profits earned in US dollars need to be translated back into sterling. If sterling strengthens, the company gets less sterling for the dollar it earned, if sterling weakens it gets more. Of the Footsie indices, the FTSE 250 is a more accurate representation of Brexit sentiment, as it includes smaller, more domestic-focussed companies. Currently, higher risk Moneyfarm portfolios have exposure to these indices. If a hard Brexit has a negative impact on growth, as we expect it will, this would typically benefit long duration government bonds. Inflation expectations could change this, especially if the momentum behind August’s six-month inflation high remains, but we assume the Bank of England will step in with monetary easing. This intervention should drive long-dated bond yields lower. 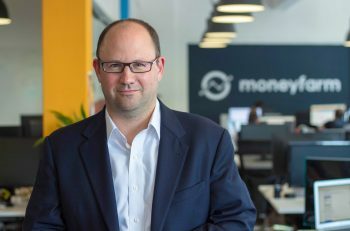 What is Moneyfarm’s sterling exposure? As sterling is expected to be the most obvious place to see Brexit sentiment, we have included currency exposure in our risk management. By limiting home country bias, using foreign exchange-hedged ETFs and limiting our sterling exposure, our portfolios are likely to benefit most if sterling depreciates. 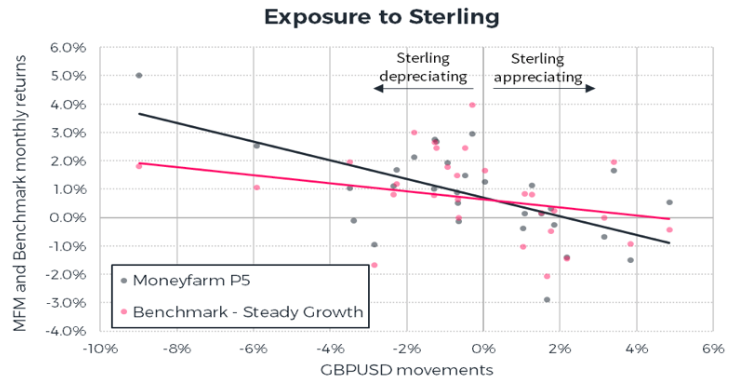 The chart above compares sterling exposure in Moneyfarm’s P5 portfolio to the ARC GBP steady growth benchmark. This simulation shows how the P5 has been built to limit downside in a hard Brexit outcome. As sterling depreciates, monthly performance outperforms its benchmark. This conservative position may limit downside in a hard Brexit outcome, but also limits upside in the event of a soft Brexit compared to the benchmark. For more information on how our simulations might behave on other portfolios or the benchmark we have used, please get in contact. As you probably earn your salary in sterling, have a property linked to the pound, and have savings exposed to UK interest rates, you’re already very exposed to fluctuations in the currency. Our asset allocation team take a global view to your investment opportunities, when in line with your risk appetite. Lower risk portfolios do have a lot of sterling exposure through both government and corporate bonds, but higher risk portfolios don’t have a big position to UK equities. You can see the geographical exposure of your portfolio on the next page. Please note that C1 refers to portfolios valued under £50,000 and C2 refers to portfolios valued over £50,000. A currency hedged ETF is designed to minimise the impact of currency changes on a portfolio, although usually cost more to own. We believe the uncertainty over Brexit and the sharp moves in currency that are likely on the horizon mean hedged-ETFs can play a crucial role in our investors’ portfolios. We’re using these hedged ETFs to try and manage the currency risk of a soft Brexit in a globally diverse portfolio and reduce volatility, particularly during periods of significant uncertainty. Our sterling exposure ranges from close to 100% in P1 to around 50-60% in P5 and P6, although this is offset by the short-sterling aspect to UK large-cap indices. Our global exposure means we should be able to limit portfolio downside in a hard Brexit scenario, due to conservative equity and sterling exposure, although we aren’t making a very aggressive bet on Brexit. Our simulation analysis shows that the Moneyfarm P4 could outperform the benchmark in a hard Brexit scenario. If sterling rallies in a soft Brexit scenario, our portfolios might not perform as well. However, our portfolio managers have been adjusting portfolios to ensure they are positioned to capture as much upside as possible over the last year. There are still a few levers within our reach to change our positioning. The tools are all there and ready to be deployed, but it’s a question of how aggressively we want to try and predict the outcome of Brexit. Given that we should have a finalised deal in four weeks’ time, we’d prefer to adopt a risk management approach. If we believe a soft Brexit is a more likely outcome, we could add more sterling-hedged equities and add more domestic UK exposure through a FTSE 250 ETF, for example. We’d do the inverse if we want to take a more aggressive hard Brexit position, reducing exposure to currency hedged ETFs, which might do less well during sterling weakness. *Computed using a stepwise regression on the last 5 years monthly data of each ETF. Details available upon request. Sterling does look cheap on most fundamental metrics, but with so much political uncertainty, the idea of fundamental value might not be that helpful. We’d rather think about an asset price as a weighted average of different probable outcomes, and as the probabilities change, so does the asset’s value. In this scenario, you could crudely think about the sterling-dollar relationship as a weighted average of a hard/soft Brexit. Here, valuation metrics matter much less as probabilities and values will probably dramatically change once the UK formally leaves the EU at 11:01 pm on 29 March 2019. Portfolio managers either have a strong view and are willing to position portfolios to reflect this, or try and manage risk as best they can in the uncertainty. We prefer to manage risk for our investors in line with their risk appetite. Just because we are taking a cautious approach, doesn’t mean we’re sat back doing nothing. We keep updating our view on Brexit as the politics and economic backdrop evolves and have been slowly adjusting the asset allocation of our portfolios to reflect this. It’s always tempting to try and trade news flow, but that’s just not what we do. We believe doing less is better than doing more.